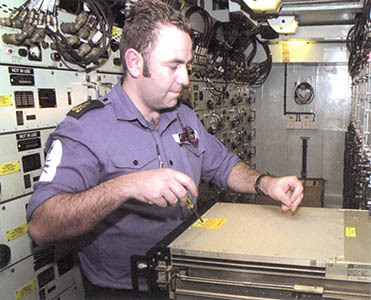 The main equipment contained in 6K Computer Room in 2001 was the Computer Outfit DAK(2) consisting of two Ferranti F2420 24-bit parallel processors used to process and analyse the data provided by the ship's sensors. Each computer used three types of interface for communication with the system peripherals or peripheral interface equipment. Combat System Highway - a dual redundant digital communications system of which DAK(2) was a member system. Computer Interrupt Equipment - which via an interface unit controlled the transfer of data between each F2420 and up to 56 peripherals' interface equipment. JZW Display sub-system - used to display real time radar video information used for target detaction, manual tracking or supervision of the auto-tracking facility. The Royal Navy's standard SHF satellite communications equipment, the Ship-borne Communications Terminal (SCOT) made by Matra Marconi Space. Inmarsat Global Area Network - a high-speed data solution that delivered critical information to anywhere in the world. The main mast carried the majority of Ark Royal's communications equipment and surveillance sensors. Also on this mast were a variety of electronic surveillance equipment that could passively detect and discriminate between transmitting targets. A civilian standard E/F band radar used solely for navigation. It gave enhanced detection of surface contacts, enabling early warning of shipping in any visibility. It was a 'stand alone' piece of equipment fitted immediately forward of the Bridge and provided the Officer of the Watch with a colour picture of all shipping ahead of the ship. This was Ark Royal's long-range radar. Working in conjunction with the Sea King AEW helicopters it provided early detection of aircraft and missiles at extended ranges. The system was integrated into the existing Action Data Automation Weapons Systems (ADAWS) and therefore did not include display units. It was synchronised from an external source and used a travelling wave tube to generate a frequency modulated composite pulse to detect both air and surface targets at a range of up to 220 nautical miles. Two were fitted, one forward, one aft a reliable and widely used I-band system designed for navigation, blind pilotage, surface surveillance and helicopter control. Its range was 90 to 100 nautical miles. A hull-mounted medium range active Sonar. Fitted with its own dedicated computer, 2016 used digital techniques to detect and track multiple underwater targets in the active mode and had a passive torpedo warning capability. 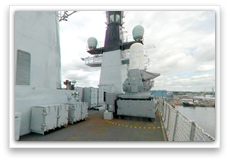 The term 'Close-In Weapons' refers to systems that defended Ark Royal from attacking missiles or aircraft. If the close-in weapons were fired, it meant that the ship was in great danger. However the close-in weapons were able to counter high-risk threats to the ship. The Phalanx close-in weapons system (CIWS) is a rapid-fire, computer-controlled radar and gun system to defeat anti-ship missiles, as well as other close-in threats. As a self-contained package, Phalanx automatically carries out search, detection, target threat evaluation, tracking, fire and kill assessment. Ark Royal had three systems onboard and was the only CVS to have Phalanx fitted - the other ships had the Goalkeeper system. Ark had two Oerlikon / BMARC 20mm GAM-B01 (G - Gun, A - Ammunition Bore Size, M - Marine, B - Design Level, 01 - Type Stage) guns. One was located on the 3K port sponson and the other on 1H starboard gun deck. These weapons provided an offensive capability against small boats, shore positions or light aircraft. General Purpose Machine Guns (GPMG) could be postioned around the ship. Ark Royal also carried small arms such as SA80 5.56mm rifles and Browning 9mm pistols. Distraction - Chaff rockets could be fires at medium range to create a false target for a missile in search mode. Seduction - Chaff and IR mortar rounds could be fired at close range to seduce a lock-on missile. Infra-Red Seduction - Used against heat-seeking missiles. SeaDart was a medium range missile that could be used against aircraft, missiles and large surface ships. With a range of 40 miles against aircraft it could provide protection for other ships deployed close to Ark Royal. The SeaDart System used Ark's two 909 Radar to track targets. When the target came inside range the SeaDart controller loaded missiles from the magazine onto the launcher and fired. The missile then homed onto the target and destroyed it. 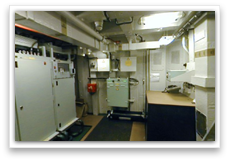 Both of the 909 Radar and the SeaDart system were removed during the 1999-2001 Refit.